Classes in fine woodwork and musical instrument making including classical guitar and mandolin making. Furniture Making: Box Making, Stools, Chairs, Tables & more. Techniques for Veneering, Inlays, Bending & more. One Day Workshops Click HERE for more details and HERE for up and coming courses. Instrument Making: Acoustic & Classical Guitar, Mandolin & Ukulele, Cigar Box Guitar & Canjo Guitar. ** NEW ** This Season: Bodhrán Making See Course Dates For Details. Mindfulness through Wooden Wall Art with Ariane. Join us at our idyllic studio and enjoy a super day away working with your hands. Our Corporate Gigs can be fielded on a date of your choice, weekends or mid week. One or two day workshops available & tailored to your needs & skill levels. 2 hour demonstrations available in Bodhrán & musical instrument making & other items. We have interactive quick projects for a more hands on experience. If you fancy something more detailed then join us for a one or two day workshop. Available 7 days a week just drop us a line and book your time. Check out our Vouchers & Books or Chaim's Design Elegance for Foodies Range for ideal anniversary, retirement, birthday & Christmas gifts. 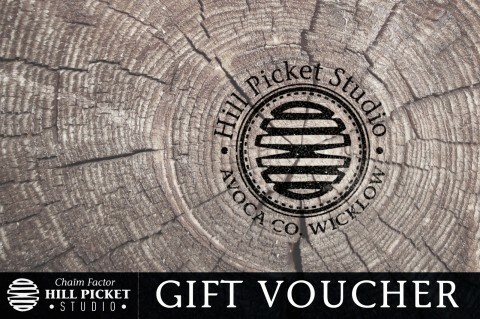 Hill Picket Studio is set in the heart of County Wicklow with spectacular views of the Vale of Avoca, the Wicklow Mountains and surrounding countryside. This setting and the facilities provided, create a wonderful opportunity for people to spend some time developing their interest and skills in fine woodwork.